21 September 2012, Singapore – The Marina Bay Street Circuit is world-famous for the lights that turn Singapore’s night into day – but Sebastian Vettel wants to add his own lustre to the 2012 FORMULA 1 SINGTEL SINGAPORE GRAND PRIX. Not only did the 2011 race-winner shine on track, he wore a ‘disco’ helmet which has built-in LED lights of its own. The motion-sensitive lights sparkle in tune to the rhythm of the car – and it was the 25-year-old World Champion who danced his way to the top of the time sheets in the opening day’s practice. 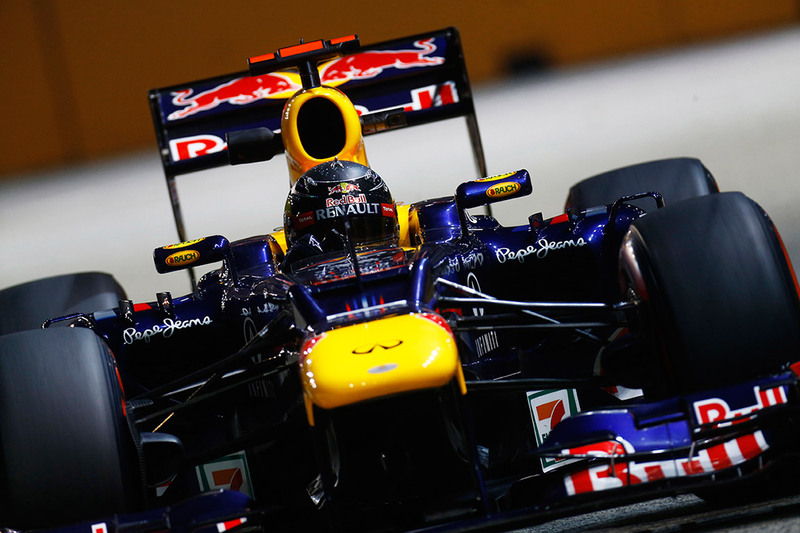 Vettel and his Red Bull Renault were fastest in both 90-minute sessions, his quickest lap of 1 minute 48.340 seconds being good enough to beat the fastest lap of last year’s Singapore race. That was set by Jenson Button, whose McLaren Mercedes was also quick on Friday evening but still finished second and three-tenths slower than Vettel. Championship leader Fernando Alonso, twice a Singapore winner already, was third-fastest for Ferrari. With Mark Webber’s Red Bull fourth and Lewis Hamilton’s McLaren fifth, that meant the ‘Big Five’ drivers who dominated the last two seasons were once again on top. There was just one interruption to Formula 1 proceedings: the second session was red-flagged after 36 minutes when Bruno Senna’s Williams Renault made contact with the left-hand wall at Turn 18 and enough damage was done for the Brazilian’s practice to be over after just 11 laps. The GP2 Series made a spectacular debut on the Singapore streets as Italian driver Luca Filippi continued his fairy-tale return to the category, six of whose previous champions will be racing in the 2012 FORMULA 1 SINGTEL SINGAPORE GRAND PRIX on Sunday. Filippi, 25, has been without a drive but was called up by the Coloni team at GP2’s last race in Italy – and promptly won. On Friday in Singapore he took pole position for the Scuderia Coloni, which is having its final race in the Series. Filippi saved his best till last, deposing Carlin’s Max Chilton from top spot in the last two minutes and securing pole when Nigel Melker’s accident triggered a red flag and there was no time for the session to be restarted. Earlier in the day a Singapore favourite, the Porsche Carrera Cup Asia, returned, with Martin Ragginger quickest in the half-hour practice session ahead of Saturday’s qualifying. Title-chasing duo Alexander Imperatori and reigning PCCA champion Keita Sawa were fourth and fifth respectively. The inaugural Ferrari Challenge races in Singapore got off to a disappointing start when Hisamori Hayashi crashed after just five minutes and brought out the red flag. The session could not be restarted in heavy rain, meaning the big field will head into Saturday’s qualifying on a virtually unknown track. There was better news for Ferrari fans at the day’s major concert, featuring Asia’s reigning R&B king Jay Chou. In his only concert for the year he thrilled about 35,000 fans at the Padang with a set of songs specially chosen for the high-speed occasion – and one of the highlights of a visually stunning show was the arrival on stage of a high-speed Ferrari 458. Tickets for the 2012 FORMULA 1 SINGTEL SINGAPORE GRAND PRIX are available for sale at Raffles City Convention Centre (RCCC) and the ticketing booths located at the Circuit Park.